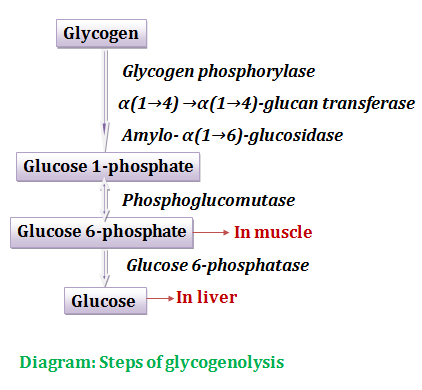 Breakdown of glycogen to glucose (in liver) or glucose 6-phosphate (in muscle) is called glycogenolysis. Glycogenolysis occurs within the cytoplasm of cells. Glycogen is the major storage carbohydrate in our body. It stored mainly in the liver and skeletal muscle. In liver, glycogenolysis occurs during periods of fasting to maintain blood glucose level. In skeletal muscle, glycogenolysis occurs during active exercise to provide glucose 6-phosphate for glycolysis in response to need for ATP. Muscle glycogen does not directly provide free glucose due to lack of glucose 6-phosphatase enzyme in muscle. Before going to steps of glycogenolysis, we should know about the glycogen structure. Glycogen is a highly branched-chain made from α-D-glucose. An α(1→4) linkase is the primary glycosidic bond of glycogen. There is a branch containing an α(1→6) linkase is also present after about eight to ten glucosyl residues. At first step of glycogenolysis, glycogen phosphorylase cleaves the α(1→4) linkases of glycogen to form glucose 1-phosphate. From the outermost chains of glycogen molecule, the terminal glucosyl residues are detached sequentially until approximately four glucose residues remain on either side of an α(1→6) branch. Branches of glycogen are removed by two debranching enzymes such as α(1→4) →α(1→4)-glucan transferase and amylo- α(1→6)-glucosidase. Secondly, glucose 1-phosphate is converted to glucose 6-phosphate by phosphoglucomutase. Finally, in liver, but not in skeletal muscle, glucose 6-phosphatase enzyme hydrolyzes glucose 6-phosphate, forming glucose that is exported to circulation, leading to an increase blood glucose. Regulation of glycogenolysis is accomplished on two levels such as allosteric regulation and hormonal regulation. 2) During muscle contraction → membrane depolarization occurs by nerve impulses → increase calcium concentration in muscle cell → calcium binds with calmodulin → stimulates glycogen phosphorylase → glycogenolysis. 3) In muscle under extreme conditions of anoxia and ATP depletion → increase AMP level in muscle → stimulates glycogen phosphorylase → glycogenolysis. 1) Glucagon and epinephrine – Glucagon and epinephrine stimulate glycogenolysis by stimulating Glycogen phosphorylase enzyme activity. 2) Insulin – Insulin inhibits glycogenolysis by inhibiting Glycogen phosphorylase enzyme activity.